Christ Church Burial Ground is a very peaceful and quaint place, despite being in the heart of Independence National Historic Park. It is associated with Christ Church, despite the fact that there is a distance of a few blocks between them. 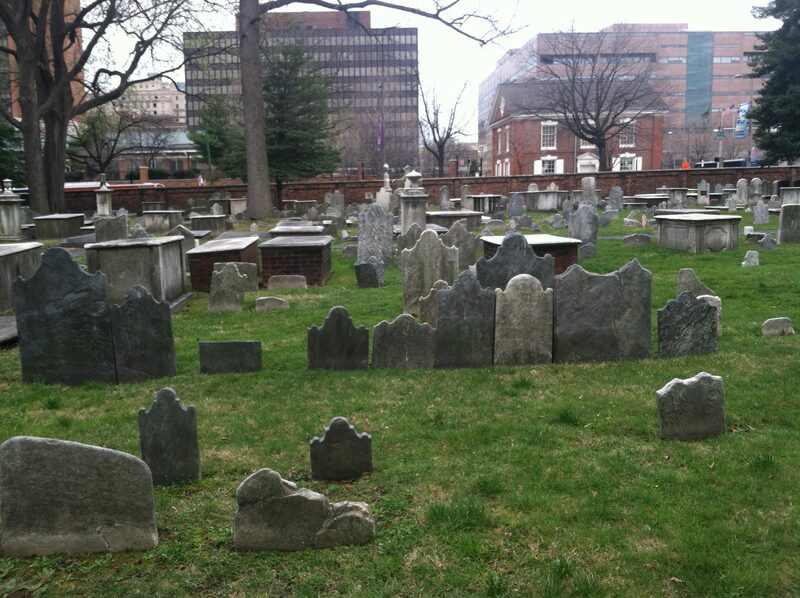 It is most famous for being the site of Benjamin Franklin’s Grave. Four signers of the Declaration of Independence besides Franklin are interred here. Other names you may see elsewhere in Philadelphia include Samuel and Elizabeth Powel, Benjamin Rush, and Philip Syng Physick. The cemetery itself feels as old as it is. The majority of the tombstones follow the same pattern as most did from those times, with the middle being the highest point. In a way, it’s an urban oasis of sorts, providing some of the little peace and quiet within Old City. There are beaten pathways throughout the dense cemetery, most of which appear to be gravel. During the summer, the trees insulate the place from the outside, providing solitude for its visitors. Admission is $2 for adults, $1 for children, and $0.01 for Ben’s grave. (that’s funny, right?) The hours are also weather dependent.